Taking your motorbike to Europe? Going on a motorcycling touring holiday? Want an insurer who will cover those riding motorbikes over 125cc? 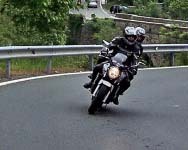 Just want motorcycling holiday insurance, European or Worldwide? We have travel insurance which will cover you! One of the pleasures of having a motorbike is the lure of the open road and what better than a trip across Europe. Whether you are heading for the Alps, Pyrenees or Southern Croatia you do need to ensure you have travel insurance that will properly cover you - and that’s not as easy as it might seem. Flexicover, as their name suggests offer flexible cover for motorcyclists - including cover those riding motorcycles of any cubic capacity as long as the biker has an appropriate licence for the bike in question and wears a helmet. And this can mean a big saving for riders of larger bikes - as most other insurers charge a loading or additional premium for those travelling on a motorcycle over 125cc (or refuse to cover them at all). We have seen customers charged £100 or more to cover their biking. The Flexicover policy covers the insured for personal accident claims , but not personal liability claims whilst biking (although your normal motorbike insurance would normally cover you for your liability here). Do bear in mind that travelling on a normal travel insurance policy which excludes accident or injury claims when you are on a motorcycle larger than 125cc is clearly very risky as even a no fault accident could mean massive hospital bills and repatriation costs. In addition the company offer a 10% discount if you sign up to their newsletter before buying your policy - so do make sure you do that! Post Office Travel Insurance covers those riding motorcycles up to a pretty hefty 1500cc - although they make it clear that they do not cover racing or competing (see the Post Office policy wording). They offer five levels of cover from Super Economy to Premier Plus, all at very competitive rates and all including cover for bikers and their passengers (as long as they are an insured person). The cheapest policy is a good option if you have say an annual policy with another provider, but you want cover for medical expenses whilst on your bike. Once again the policy does not cover personal liability insurance, which your normal motor bike insurance should. JS Insurance cover motorcycles up to and over 350cc, providing cover for you and your group whilst on your trip away. They can still cover motorcycles above 350cc but you will need to let them know. Many accidents can occur whilst being on a bike so it is important to ensure your insurance covers you for all the activities you want to participate in to avoid being presented with a hefty bill. If you have a pre-existing medical condition, no need to worry, JS Insurance may very well still be able to insure you so explore this option before giving up! Flexicover does not have any restrictions on the bikes you can ride - as long as you are licensed to ride the bike in the country in question. So, whether you have a full-dress tourer such as a Yamaha Royal Star Venture, an adventure touring motorcycle like a BMW F800GS or a sport touring motorcycle such as a Honda VFR, you can travel in the knowledge that you have great quality travel insurance. Both Flexicover and the Post Office offer both European and Worldwide policies and will cover your motorcycling trip anywhere as long as your licence is valid for the bike you are riding in the country you are visiting. You can also add cover for Winter Sports.